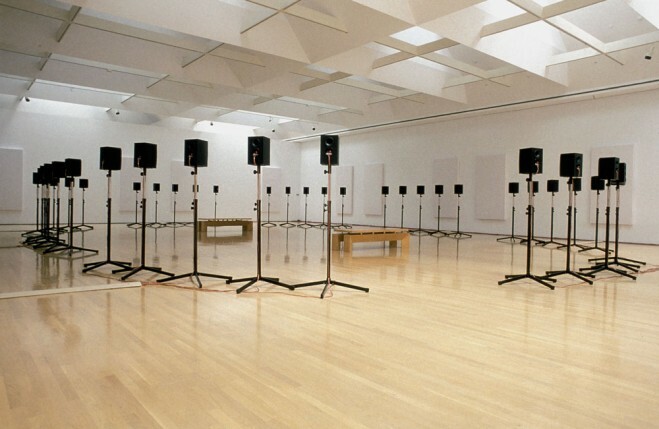 Installation view of Janet Cardiff's Forty-Part Motet, 2001 40-track audio installation, 14 minutes in duration, at the Musée d'Art Contemporain, Montreal 2002. Courtesy of the artist and Luhring Augustine, New York. This brilliant sound sculpture by Canadian artist Janet Cardiff is a reworking of Spem in Alium by Thomas Tallis, a 16th-century English composer. Forty separately-recorded choir voices are played back through 40 speakers positioned around the gallery. This exhibition was organized by The National Gallery of Canada. Its installation at the Mobile Museum of Art is presented by PNC. Additional support is provided by the city of Mobile, Alabama State Council on the Arts, National Endowment for the Arts and Dr. Bree Hayes (Board Member, Mobile Symphony Orchestra). Access to this exhibition requires a $5 special exhibition ticket and a museum admission ticket for adults, seniors, and members. Children under 6 are free and students with student ID or school groups are $3 per person in addition to museum admission.